Secretary of State Mike Pompeo and National Security Adviser John Bolton on Friday denied that they derailed talks between President Donald Trump and Kim Jong Un two weeks ago in Vietnam after a fiery statement from North Korea accused the two men of creating a environment of hostility. While both said that categorization was "inaccurate" or "wrong," there has been little contact between the two sides since the Hanoi summit ended without a deal, and each country said their offer would not change. The threat comes after North Korea reassembled a missile engine test site in what analysts said was likely a signal of its anger over the summit's outcome. The meeting in Vietnam ended when Trump walked away from North Korea's offer to dismantle the Yongbyon nuclear facility in exchange for relief from economic sanctions targeting their industries like coal, oil, and fishing and totaling billions of dollars. The U.S. has said since then that it will only accept its definition of "complete denuclearization" -- the total dismantlement of North Korea's weapons of mass destruction program. "The missiles, the weapons systems, the entire WMD program -- that's the requirement laid out by the United Nations Security Council," Pompeo said Friday. While Choe praised Kim and Trump's relationship and said their "chemistry is mysteriously wonderful," she went after Pompeo and Bolton by name for creating an atmosphere of hostility and mistrust with their uncompromising demands. "That's inaccurate," Bolton told reporters at the White House, with Pompeo adding later with a laugh, "They're wrong about that, and I was there." It's not the first time either man has been blasted specifically by the North Koreans, who have tried to get Trump and Kim together in the belief that he is more amenable to their position. After the Singapore summit last June, Pompeo held the first meetings with North Korea, meeting his counterpart Kim Yong Chol in Pyongyang that July. But those meetings broke down after the U.S. demanded a full declaration of North Korea's nuclear inventory up front -- a "gangster-like demand," according to the regime. "Following that, we continued to have very professional conversations, where we tried our best to work together and represent our respective sides. 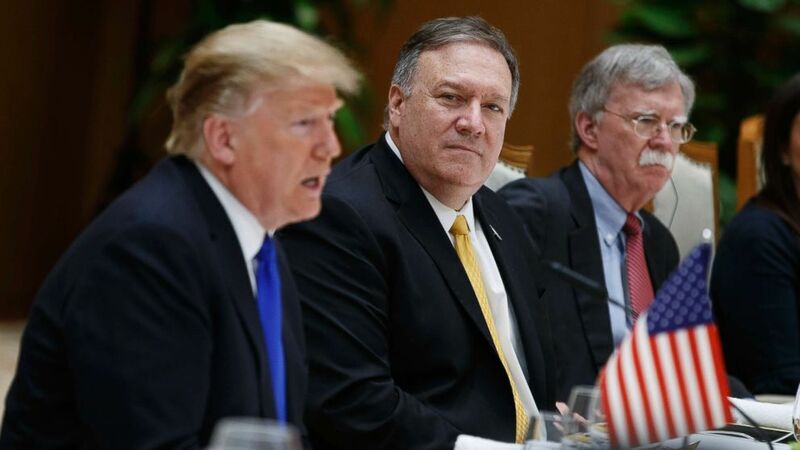 I have every expectation that we'll be able to continue to do that," Pompeo said Friday. To that end, he tried to squeeze a ray of optimism out of Choe's comments, saying, "She left open the possibility that negotiations would continue, for sure. It's the administration's desire that we continue to have conversations about this."